November 19, 2009: You don't always have to have a rocket to do rocket science. Sometimes a mere airplane will do – that is, a mere Boeing 747 toting a 17-ton, 9-foot wide telescope named SOFIA. 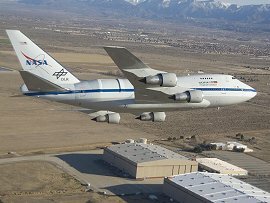 Short for Stratospheric Observatory for Infrared Astronomy, SOFIA will observe the universe while gliding through the stratosphere at 45,000 feet. When it begins operations next year, it will be the world's biggest, most advanced airborne observatory. Right: NASA's SOFIA infrared observatory 747SP overflies its home, the Dryden Aircraft Operations Facility in Palmdale, Calif. Credit: NASA/Jim Ross. "SOFIA is set to achieve some spectacular science," says project scientist Pamela Marcum. "For instance, this telescope will help us figure out how planets form and how our own solar system came to be." And as a mobile observatory, it can fly anywhere, anytime. SOFIA can move into position to capture especially interesting astronomical events such as stellar occultations (when celestial objects cross in front of background stars), while ground-based telescopes fastened to the "wrong" geographic locations on Earth's surface miss the show. SOFIA will fly above the veil of water vapor1 that surrounds Earth to take a wide-eyed look at the cosmos. Although our galaxy teems with planetary systems, astronomers don't know exactly how they form. That's because ordinary telescopes can't see through the giant, dense clouds of gas and dust that spawn planets. 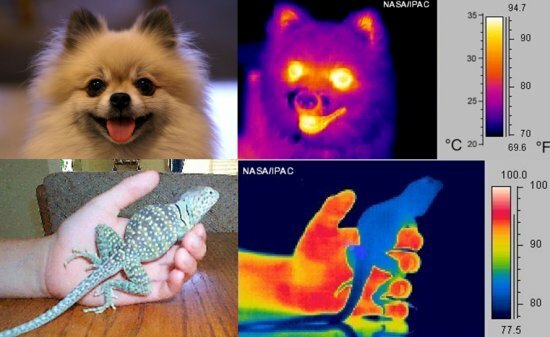 Using infrared wavelengths, SOFIA can pierce the haze and watch the birthing process – showing scientists how molecules come together to construct worlds. "Once a large enough core forms, its gravity becomes strong enough to hold on to gas so more hydrogen and helium molecules can 'stick.' Then these large cores can grow into gas giants like Jupiter and Saturn. Otherwise, they remain as smaller rock-ice planets." 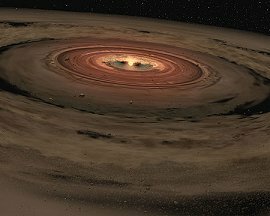 Right: An artist's concept of a protoplanetary disk where young planets are being born. Credit: NASA/JPL-Caltech. "SOFIA will also be able to pinpoint where basic building blocks like oxygen, methane, and carbon dioxide2 are located within the protoplanetary disk." Knowing where various substances are located in the disk will cast light on how they come together, from the "ground" up, to form planets. One of the telescope's key strengths is its ability to complement other infrared observatories. With a 20-year lifetime, it can do follow up studies on objects shorter-lived infrared scopes don't have time to hone in on. If, for example, an orbiting observatory like WISE spots something deserving of more attention, SOFIA can move in for a long, slow look, while WISE continues gazing at the rest of the sky. "WISE is designed to scan the entire sky at infrared wavelengths, gathering survey data for multitudes of objects rather than studying targeted objects in great depth," explains Marcum. "But SOFIA has time to spare for deeper studies." SOFIA can also do follow-up science to reap the full benefits of discoveries from Herschel's deep spatial surveys, and later, the James Webb Space Telescope's near- to mid-infrared investigations. "Once Herschel runs out of its 3-year supply of coolant, SOFIA will be the only observatory routinely providing coverage within the far-infrared to submillimeter wavelength range. This part of the spectrum is largely unexplored territory." "And although SOFIA covers the same part of the spectrum James Webb (JWST) covers, SOFIA is optimized for wavelengths just beyond JWST to complement its observations. SOFIA will do a bang-up job observing between the JWST and Herschel wavelength gap." Unlike these space-based scopes, SOFIA can "head back to the barn" periodically for instruments to be repaired, adjusted, or even swapped out for new and improved science instruments – keeping pace with cutting edge science from a "mere" airplane. For more information on SOFIA's science mission, see http://www.sofia.usra.edu. 1The veil of water vapor enveloping Earth acts like an invisible "brick wall" to the infrared energy from cosmic objects, absorbing most all of it. The energy journeys millions of light years only to be stopped by our planet's atmosphere within 5 miles of reaching us. SOFIA solves this problem by viewing the heavens from "above the veil" – something ground-based scopes can’t do. Like SOFIA, space-based telescopes collect the infrared energy before it reaches Earth. 2SOFIA has an exceptional ability to finely separate out and distinguish different infrared wavelengths, allowing it to capture these spectra. * SOFIA is a joint program between NASA and the German Space Agency, Deutsches Zentrum fur Luft- und Raumfahrt, Bonn, Germany. The SOFIA program is managed by NASA's Dryden Flight Research Center, Edwards, Calif.; the aircraft is based at the Dryden Aircraft Operations Facility, Palmdale, Calif. NASA's Ames Research Center, Moffett Field, Calif., manages the SOFIA science and mission operations in cooperation with the Universities Space Research Association, Columbia, Md., and the Deutsches SOFIA Institute, Stuttgart, Germany. * Plans are in the works for writers and teachers to be invited to join scientists with SOFIA up where the air is thin. * How do you keep a telescope still enough to point accurately and stay "on point" in a moving airplane? "First, SOFIA's plane will fly in the relatively stable stratosphere," says Marcum. "Also, we have a clever vibration isolation system. The mirror is mechanically isolated from the plane. Shock absorbers, serving the same purpose as those found in a automobile, surround the giant bearing that bears the telescope's weight, isolating the mirror from vibration in all directions."